That solo thought was at the forefront of Ryan Truex’s mind, surprising considering his runner-up finish in the NASCAR Camping World Truck Series season-opening NextEra Energy Resources 250 at Daytona International Speedway Friday night. Hailing from Mayetta, N.J. and driving the No. 81 Toyota Oska Parts Distributor Toyota Tundra for Hattori Racing Enterprises, Truex was making a return of sorts to the NASCAR national series. His last race was a NASCAR XFINITY Series event at Texas in November, just one of four races he ran in the second-tier division last season (those were the only starts he made at the national series level in 2015). Prior to those select races, Truex had competed in 23 NASCAR Sprint Cup Series events with BK Racing in 2014, finishing a career-best of 20th at Pocono. 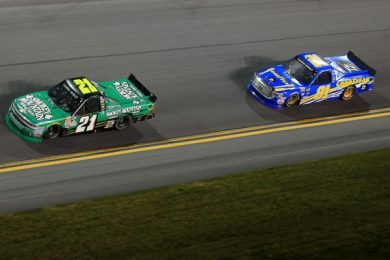 Truex, making his return to Truck Series for the first time since Daytona in 2014, led 14 laps late in the 100 lap event at ‘The World Center of Racing’, including the second-to-last time around, but lost the lead mere moments before the final caution — which ended the race — was thrown, relegating him to a second place result. Despite it being his best finish across all three national series, it was still a bittersweet ending for the second generation driver — who wanted a Daytona triumph. In his mind, without the final wreck happening, Truex saw himself getting back around race winner Johnny Sauter and taking the checkered flag. This season, with backing from Shige Hattori’s team, Truex is hoping to run the full Truck Series schedule. Right now, a few races still are in need of sponsorship, but he plans to be at the next two events on the calendar. “I hope that was enough for us to go full-time, and like I said, we’ve got a little bit we’ve still got to get sorted out for some races, but we’ll be in Atlanta and we’ll be at Martinsville, and we’re second in points right now, I think, so if we can continue that streak — we’ll be good to go,” he added. Truex has never run full-time in a NASCAR national series, making this a potentially huge opportunity for the two-time K&N Pro Series East champion (2009 and 2010). For right now however, soaking it all in and enjoying the moment is what Truex plans to do — because frankly, a few months ago, the 23-year-old had no idea if he would ever race again, much less make it onto the podium at Daytona. In fact, Truex was looking at a potential job on a clam boat a few weeks ago, prior to this opportunity with Hattori. But even with the uncertainty surrounding his effort, Truex never gave up — he let time play its course and now has a second place finish at Daytona to show for it. Truex will return to the racetrack next weekend for the Great Clips 200 at Atlanta Motor Speedway, his first Truck Series start at the 1.5-mile circuit. The green flag is slated for 4:30 p.m. ET with coverage on FOX Sports 1, the Motor Racing Network and SiriusXM NASCAR, channel 90.